One of the chief concerns with open doors is employee safety. With open doors that aren’t constantly monitored, intruders are able to enter the warehouse and eventually other areas of a facility. The intruder might steal from warehouse stock, or from employee lockers or offices. The intruder could damage or vandalize equipment, take photos, or otherwise endanger the company’s operations. The worst case scenario is that employees could be personally endangered by a confrontation with an intruder. Intruders may get access to running machinery, forklift aisles, or other dangerous areas where they or others can be injured, and the company might have some liability for the intruder’s well-being. What are some steps that can be taken? Leave the doors closed. This is sometimes not an option for access, climate control or convenience reasons. Guard the dock doors. This is labor intensive, but if people are constantly in the area and trained to identify and deal with unauthorized visitors, it can work. In some larger operations, there might be full time security personnel. These are economical, convenient and easy to install. They allow fresh air in, but restrict people. They will have to be opened when the door is put to use, but they also provide a degree of fall protection on elevated docks, since people on the inside aren’t able to accidentally fall off the dock. They fold completely out of the opening when not in use. Their primary role is one of security, so they will not allow forklifts and people to enter or exit without someone unlocking and moving the gate. These doors are really good for a couple of applications, but will not do much for safety or security. They allow a dock opening to remain open, and for easy passage without compromising climate control. They are also good for preventing airborne debris and dust from contaminating the facility while trucks are unloaded, loaded, or shipments processed. These doors are good for security and safety, but don’t allow you to leave the dock door open. They are great for egress, in that they allow forklifts to access any opening quickly and easily, but close so quickly that unauthorized access isn’t likely. Also see vinyl roll-up door alternatives for exterior security and control. For those applications where fast access is desirable, and the dock door should remain closed, these are a good option. These doors are one of the best compromise options. They play a security role since they can be closed to fully deny entry at the dock door, but still allow sunshine and fresh air inside. 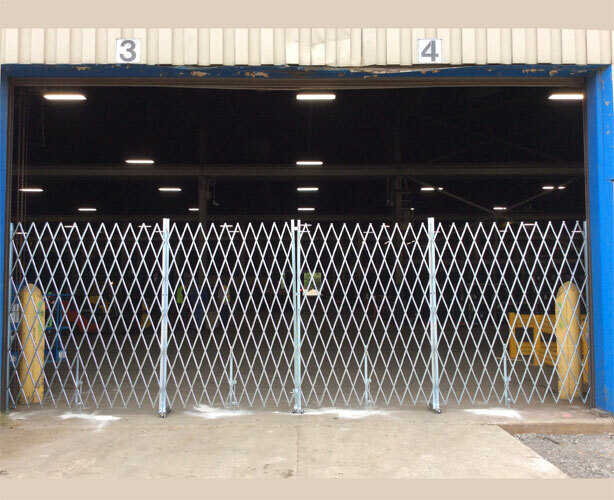 Unlike folding gates, they also protect the interior from dust and airborne debris, so sensitive areas like FDA, paint shop, product packaging, sensitive machinery or finishing applications. They have to be moved for traffic, but that’s no more difficult than dealing with a folding gate or a closed dock door. They also provide a 65% shade factor, meaning you can allow fresh air without as much bright sunlight if desired.